Cricket - Brighouse v Bowling Old Lane. Chris Wynd for Brighouse. BRIGHOUSE strengthened their Bradford League promotion bid with a second Championship 2 win in two days yesterday. They were eight wicket winners at Liversedge, who made 216-7 with the help of 55 not out from Ahmed Khan, Abid Awain taking 3-66. 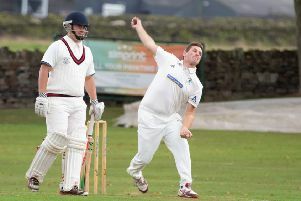 The Russell Way men, who had won narrowly at Northowram on Saturday, lost only two wickets in knocking off the runs. Second-wicket pair Chris Wynd (85 no) and Deron Greaves (83) added 119 to pave the way for success. Brighouse climbed to third, having been boosted by defeats for Wakefield St Michael’s and Birstall in a programme rearranged from the start of the season. Northowram Fields did Brighouse a favour by beating visitors Birstall by 16 runs. On a day when they were expecting to have to field three teams, Northowram had some ‘retired’ players booked in advance for a return to action and Paul Bottomley, Chris Thompson and Robert Larner all did well. Bottomley made 63 while skipper John Lister (67 no) and Dru Patel (38) also contributed well as the Rams made 240-6. That looked unlikely to be enough when Birstall openers Ian Carradice (71) and Eric Austin (56) shared a stand of 106 but slow bowler Thompson, after taking a couple of overs to get his eye in, dismissed both. Josh Dodd, one of numerous up-and-coming players at the club, then took 5-65 and speedster Josh Bennett (3-41) returned to help clear up the innings for 224. Former first team opener Larner hit 100 as the seconds made it back to back weekend wins at Birstall. WALSDEN’s first and second teams had contrasting fortunes in cup competitions yesterday. The firsts lost their Lancashire Knockout Cup quarter-final by three wickets away to Northern at Liverpool, pro Umesh Karunaratne having made 76 in their 193-7. The seconds won the Lancashire League’s Telegraph Cup with victory over Burnley, opponents they had tied with in the league on Saturday. Burnley made 221-7 and the Scott Street men recovered from 9-3 to win by three wickets.